BioMaxed is a term the author coined for the “biologically maximized career” or life. 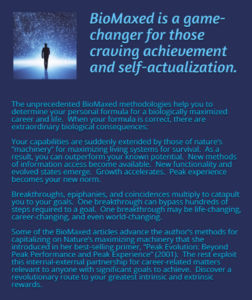 Biomaxing is a game-changer for career strategy, life strategy, goal achievement, self-actualization, and peak performance. This is a collection of articles which advance the author’s work. All of Lauren’s books investigate and make accessible a new level of human potential through a partnership with the biological infrastructure of which we are a part and with which we have co-evolved to operate. An internal-external partnership, if you will. Some of the BioMaxed articles advance the methodology that Lauren introduced in her best-selling primer, Peak Evolution: Beyond Peak Performance and Peak Experience (2001). The rest apply the internal-external partnership to career-related matters that are relevant to anyone who has significant goals to achieve. 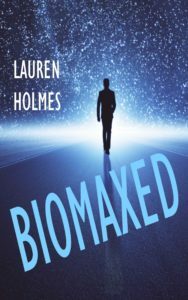 As such, BioMaxed is a must-read for all aspiring worldbuilders and anyone who needs to leave their most impactful footprint on the world. It’s a new way to achieve bigger goals faster. These articles are filled with self-provable scientific breakthroughs which will forever raise the bar on human potential. Your potential. BioMaxed reveals an unprecedented formula by which to achieve sustained, self-sufficient, self-love. This self-love arises from the continuous creative self-expression of one’s essence. Externally sourced love thus becomes a luxury rather than a necessity. Other evolved states such as unity consciousness emerge as a byproduct. The internal is extended by the external. Circuits inside and out complete. Processes partner. Mechanisms mesh. Systems synergize and synchronize. Synchronicities surge. Coincidences cluster to catapult you to your goals. Breakthroughs and epiphanies multiply. Growth accelerates. Functionality flourishes. Evolved states emerge. Peak experience becomes your norm. The whole becomes greater than the sum of the parts. You begin to operate beyond your known potential. Your biologically maximized career can become life-changing and world-changing beyond your expectations. And so too can your rewards.